This book is a bit of a departure from what I usually read and review. It was loaned to me by Rev. Stanley, the executive minister at my church; someone I love and respect. Plus, if the executive minister of your church tells you to read a book, you read it. So I did. In the spirit (pun intended) of being totally transparent, I’ve had the book for a few years and figured it wasn’t going to be my cup of tea, so it has taken me some time to get to it. However, because it’s so short–and actually really good–I read it in a few hours on Sunday. Sunday…fitting, huh? I think it can be enjoyed by believers in Christ as well as non-believers; but Christians will clearly get more out of it. It is a short book and an over all quick read. (As such, I am slightly embarrassed that it took me years to get to it. But hey, I had some serious vampire and romance novel series to tackle.) There are plenty of Bible references and passages throughout the book to illustrate the point and premise–which is that Jesus focused on teaching and nurturing his disciples so they could spread the word about Christ’s teachings after his crucifixion here on earth. The concept and theme of this book can be applied outside the church and when it comes to corporate America and beyond, it already is. In my day job, we focus on marketing and building a relationship with our most engaged clients. In turn, they become advocates for our services and company. How often do your friends or family recommend a brand, service, vacation spot, etc. to you? Think of loyalty programs, discount cards, etc. People share their insights and how you too can have the same experience. 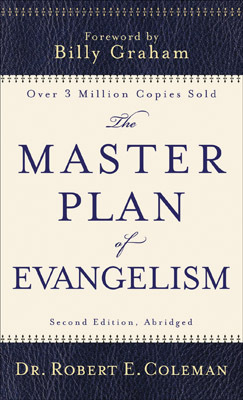 In The Master Plan of Evangelism, it’s no different. Only, instead of talking up a great hotel, the book is detailing how to successfully spread the word of Christ. How to build a following. In place of points towards another stay, eternal life is the reward. As far as I’m concerned, that’s better than any discount program out there. At its core, the point being made is that Christ focused on a few to spread the word to many. He did it with purpose and thoughtfulness. The results are astounding. I read recently that 32% of the world’s population are Christians, over 2 billion people. I’d say Jesus’ methodology worked well. And Amen for that.